The Scottish Football Blog: Hibs: When Irish eyes are smiling? I enjoyed this, more like that would be good! Are you sure Dan McMichael was born in Dublin? There are only three McMichaels in the 1901 census born in Dublin and they were all born in County Antrim, where most of the Irish McMichaels are found. Lugton refers in the Making of Hibernian the Romantic Years as a "Leither". Alan Lugton refers to "Leither Dan" in 'The Brave Years' as well. I have, however, read contemporary accounts that refer to him as being born in Dublin - perhaps me duplicating the journalistic shorthand of the day but certainly in this instance Alan Lugton would seem to be mistaken. I checked the 1911 census when writing this and the Dan McMichael of Easter Road listed as a football club secretary gives his birthplace as Ireland. Moreover the three children he had over the age of 16 are listed as being born in Coatbridge which again fits with the other accounts of his life. This also fits with the records found for Coatbridge in 1891 and again the birthplace is given as Ireland. Oddly I couldn't find a match for this Dan McMichael in the Scottish census of 1901. "Leither Dan" would seem to be an honorary title. Thanks for the information. At 20.04 I meant to say "In the 1901 Irish census there are only three McMichaels living in Dublin". Most McMichaels in the 1901 Irish census were born and living in County Antrim. It is possible that Dan's family moved to Dublin before he was born. There are almost no Irish census records surviving before 1901 unfortunately. Again thanks for the information. Michael. "Thanks for the information. At 20.04 I meant to say "In the 1901 Irish census there are only three McMichaels living in Dublin". Most McMichaels in the 1901 Irish census were born and living in County Antrim. It is possible that Dan's family moved to Dublin before he was born. There are almost no Irish census records surviving before 1901 unfortunately. Again thanks for the information. Michael." Cheers Michael - not quite sure what's going wrong with the comments. I gathered that about the Irish census, makes things a bit tricky. Maybe one day I will get round to researching this properly though. "I just noticed another mistake at 20.04 I should have said "Lugton refers to McMichael in 'The Making of Hibernian, the Brave Years' as a "Leither"." I don't have the third volume 'The Romantic Years' yet! Interestingly in the 1901 census the only two Whelehans in the whole of County Roscommon (it's a Westmeath surname) are Michael (36) and Pat (38) from Kilglass. 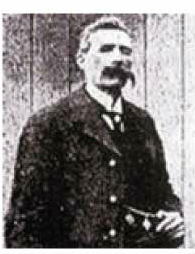 Michael Whelehan, the first captain of Hibernian was born in Kilglass in 1854. It is more than likely that they are related to him and his third great grandnephew Pat Stanton."